The world produces enough to feed the entire global population of 7 billion people. And yet, one person in eight on the planet goes to bed hungry each night. So why does hunger exist? Fortunately, it seems that worldwide, the number of hungry people has dropped significantly over the past two decades, but 795 million people continue to struggle with hunger every day. Many factors contribute to the state of hunger both in the United States and abroad. The reasons are complex and varied, and often interconnected. One in 9 people suffers from hunger each day around the world, that’s a total of 821 million people worldwide. Even so, the world produces enough food to feed all 7.5 billion people. The good news is that, the level of hunger in the world has decreased by 27% since 2000. The world has committed to reaching zero hunger by 2030 as part of the 2030 Agenda. Africa is the continent with the highest percentage of undernourishment and malnutrition, affecting almost 21% of the population (more than 256 million people). South America’s percentage of undernourishment has also risen from 4.7% in 2014 to a projected 5% in 2017. The Central African Republic remains the world’s hungriest country as of 2018. The undergrowth of children, one of the main side effects of malnourishment for children, is on the decline: Between 2012 and 2017, the number of stunted children decreased from 165.2 million to 150.8 million. When it comes to world hunger, most of us tend to ask that one simple question of ”what?” not thinking that on a more profound level we should ask ourselves “why”. Let’s look at some of the most common root causes of world hunger that we need to address if we’re to meet our goal of a hunger-free world by 2030. People who live in poverty often face hunger as they cannot afford nutritious food for themselves and their families. On the flip-side, hunger fuels poverty as it’s difficult for people to earn more money when they’re undernourished and totally lack energy. Food shortages in developing countries are extremely common. 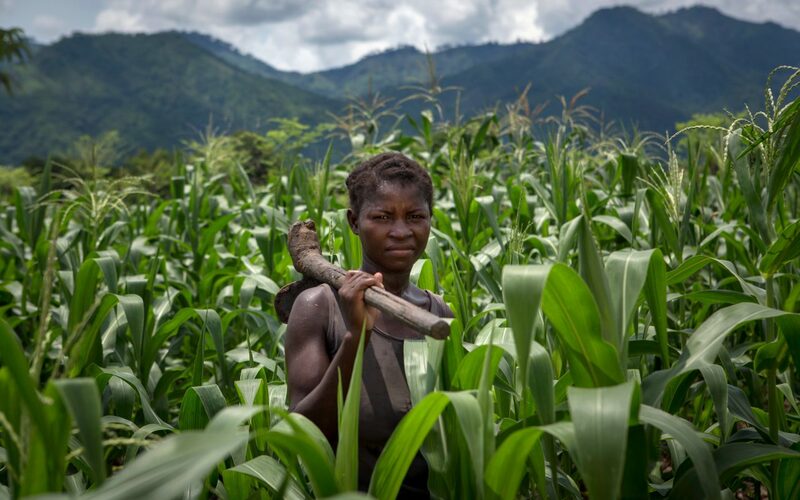 The people most affected are smallholder farmers and their families who depend on their own surplus to survive between harvests. The period leading up to a harvest is known as the “hungry season.” Food from the previous harvest runs out and families cut back on meals. This period of time may last for months depending on the size of the previous harvest. A similar situation can be seen in more developed countries like the U.S., where families with very low incomes run out of money at the end of the month. Families cut back on how much they eat and then eventually skip meals altogether on some days. Another reason for food shortages is up to 40 percent of food grown in some countries is spoilage. Smallholder farmers do not have adequate storage facilities to protect their supplies against pests and weather. According to the World Food Programme, 1/3 of all food produced — over 1.3 billion tons of it — is never consumed. What’s more, producing this wasted food also uses other natural resources that, when threatened, have a ripple effect in the countries that are already hit hardest in terms of hunger, poverty, and climate change. Producing this wasted food requires an amount of water equal to the annual flow of Russia’s Volga River and adds 3.3 billion tons of greenhouse gases to the atmosphere. When we talk about world hunger, we’re not just talking about access to food, but also access to the right foods and by right we mean, the most nutritious ones. In order to thrive, humans need a range of foods providing a variety of essential health benefits. Poor families often rely on just one or two staple foods – like corn or wheat – which of course do not offer them complete nutritious meals containing all the critical macronutrients like protein, and they’re also missing out on lots of important vitamins and minerals. The less nourished and balanced a person’s diet, the poorer their health will be. This is especially important for women and young children: Nutrition support during pregnancy and up to the age of five can help protect children for their entire lives, reducing the likelihood of disease, poor health, and cognitive impairment. Through the LANN project, communities in countries like Sierra Leone are learning how to identify nutrient-rich wild foods that are safe to eat in order to make the most of their available resources. This is one of the many ways we look for sustainable solutions for malnourished communities. While many people live in areas that are vulnerable to events in nature, food is always available for those who can afford it; hunger during hardships or in times of disaster hits only the poorest. Millions of the world’s poorest and most vulnerable continue to live on the edge with little surplus (if any) to sustain them even in normal times let alone in times of environmental stress. Extreme weather events also affect many so-called developed countries with entirely different results. In the United States and other high-income countries, hunger is mainly caused by poverty that results from a lack of jobs or because jobs are being paid too little to get by from paycheck to paycheck. Hunger rates rise when the national or local economy is in a slump. People lose jobs and cannot find work. Once the economy improves some people continue to struggle to find work. For instance, social categories that are discriminated by society like people who have been in prison face wide-scale discrimination that makes it difficult for them to find jobs once they reenter their community. In single-parent families, the parent may not be able to take a job or work enough hours because of no childcare options. It’s not just weather and harvest patterns that lead to hunger: War and conflict are also among the leading destroyers of food security. In South Sudan, civil war has led to mass displacement and abandoned fields. The resulting crop failure, combined with a soaring inflation rate that puts imported food out of reach, has left 3.5 million people hungry. Similarly, Yemen’s ongoing conflict has led to nearly 18 million people facing hunger — over 65% of the population. Female farmers are responsible for growing, harvesting, preparing, and selling the majority of food in poor countries. Women are on the frontlines of the fight against hunger, yet they are frequently underrepresented at the political or social gatherings where important decisions on policy and resources are made. ‹ Medical effects of extremely low temperatures: why they hurt and how do we prevent the damage? › How do you know a company’s culture fits your needs and personality?